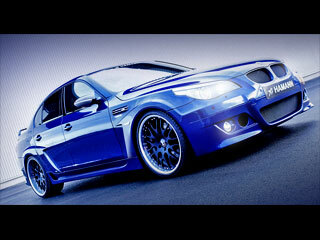 One of the most famous tuning companies in Europe – Hamman has exceed all expectations. This time it drawn a bead on a BMW sporting model called M5 to improve its perfection. This article is about how it all happened. Exterior An exterior of the car was introduced to the publicity in two colors (mat black and blue). The most radical change on the bodywork of M5 is its general broadening – so called Wide Body. A front bumper is connected with a mask (typical for the BMW cars). The bigger hole for an air intake to the cooler and smaller holes for disc brakes, are situated in the bottom part of the bumper. The broadening (wide body) is used to the off-take of a warmed air from front brakes and for the intake to the rear ones. The interior is in the red-black style. There is a red colored carbon is used on the steering wheel, a center of the console and other parts. The seats are coated with a quality leather (also in red and black). They are also heated and ventilated. Stock pedals was removed and replaced for the sporting Hamman pedals. Performance tuning: The performance tuning: The 5 liters, 10 cylinders engine hidden under the red carbon cover was improved by the HM/M+60 sporting kit (a re-programming of the control unit, a removal of the limiter, an air filter, a catalyzer ). This has caused an increasing of the performance from 507hp to 537hp (347kW). 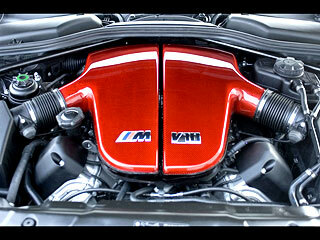 The modification of the heads of cylinder and the exhaust manifold has increased the performance to 567 hp (417kW). A maximum torque is about 533Nm and the top speed is 320kmph. That’s nice, isn’t it? Do you like the Hamann BMW M5 Tuning?